The Murdoch media in Australia, Newscorp, will never publish how most US polls are showing Trump well in front and lining up to be the next president. A new Monmouth University Poll gives Donald Trump his most commanding national lead yet — 27 points — in the race for the Republican presidential nomination, with Ted Cruz coming in second. Ahead of Tuesday night’s GOP debate, Trump led the poll with 41% among Republican and Republican-leaning voters. Far behind were Cruz (14%), Marco Rubio (10%) and Ben Carson (9%). 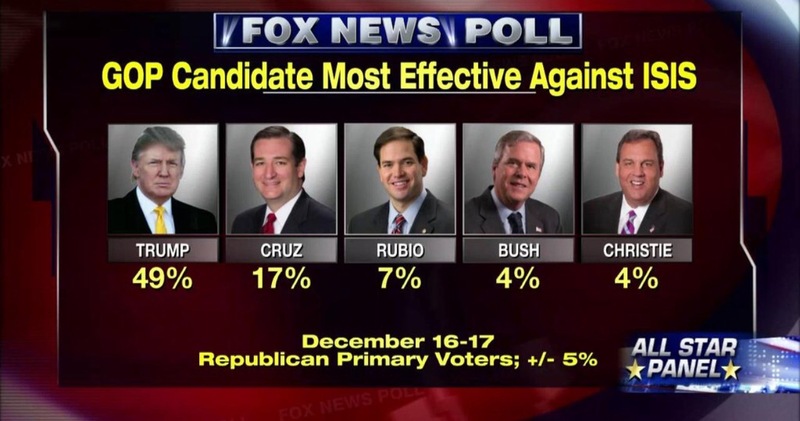 All other GOP candidates polled below 5%. However, Republican voters other than Trump or Cruz supporters felt the front-runner doesn’t have the right temperament to be president, according to the poll. “It has become abundantly clear that Trump is giving his supporters exactly what they want, even if what he says causes the GOP leadership and many Republican voters to cringe,” said Patrick Murray, director of the polling institute in West Long Branch, N.J.
On Dec. 7, Trump said the U.S. should stop allowing Muslims into the country “until our country’s representatives can figure out what is going on.” The remark drew widespread condemnation from lawmakers, including Republicans. The poll, released Monday, was conducted via telephone from Dec. 10-13, after Trump proposed the Muslim ban. The top issue for Republican voters polled nationwide was national security and terrorism, with 39% selecting it as their first choice and 18% selecting it as their second. Overall, 65% of those polled agreed Trump has the temperament to be president, but when Trump and Cruz’s supporters were excluded, that percentage dropped to 43% while 55% of the remaining voters said he does not have the right temperament. Trump’s overall showing increased by 13 percentage points from his 28% result in Monmouth’s mid-October polling. His personal rating also improved, now standing at 61% favorable and 29% favorable — an all-time high for his rating, according to the Monmouth poll. In Iowa, a Quinnipiac University Poll released Monday finds a close race between Trump and Cruz, who polled at 28% and 27%, respectively, among likely Republican caucus participants. Rubio came in third, with 14%, followed by Carson, with 10%. No other candidates polled above 5%. Terrorism was the most important issue for 30% of Iowa likely Republican caucus participants in deciding their vote. Thirty-three percent of those Republicans polled said Trump can best handle terrorism, while 24% chose Cruz and 9% picked Rubio. Posted on December 21, 2015, in Corporate Government, Donald Trump, General, Gun Control Australia, international, Muslim, New World Order, People Power, Politicians, US election and tagged Donald Trump, Obama, US election. Bookmark the permalink. Leave a comment.